The Founding Fathers have fueled interest since the formation of the United States nearly 242 years ago. Historic sites nationwide have been erected to honor the men who helped to create this country, and numerous places these great men frequented have been preserved for the sake of American heritage. During the 18th century, the center of social and political life could be found at the town tavern, and the Founding Fathers were known to frequent several in the colonies. In honor of this Fourth of July, we’re highlighting some of America’s oldest watering holes, where you can still share a pint the way the Founding Fathers may have nearly 250 years ago. While it could be said that the entire city of Philadelphia, Pennsylvania is a testament to Benjamin Franklin (the city even has its own “Benjamin Franklin Parkway”), those searching for a place to eat might try City Tavern, located in Independence National Historic Park. First commissioned by city citizens in 1772, the pub opened for business in 1773, and was described as the “most genteel tavern in America” by figures like John Adams. City Tavern was a favorite haunt of several Founding Fathers, including George Washington, John Jay, Thomas Jefferson, and Benjamin Franklin. Franklin especially was known to hang out in the inn’s dining room, and the bar quickly became an epicenter of early American political culture, even serving as the designated gathering point for delegates before and after official Continental Congress meetings. Unfortunately, the original City Tavern building was badly damaged in an 1834 fire, before being razed completely in 1854. During the 1970s, an accurate replica of the original building was built on the site, which has been in operation since 1976. Today, you can try 18th century classics like West Indies Pepperpot soup at the pub, before finishing your meal with the “Poor Richard’s Tavern Spruce,” a beer brewed from a recipe written by Benjamin Franklin during his time as ambassador to France. The menu also features an ale brewed from Thomas Jefferson’s personal recipe, and other 18th century classics like braised rabbit. Once upon a time, New York City was not only the most populous city in the United States, but was also the nation’s capital. During the time of the Founding Fathers, New York was considered the center of American life. This heritage can be seen all over the city, but history enthusiasts will find the city’s oldest building at the Fraunces Tavern, which has been in operation since before the Revolutionary War. Fraunces Tavern, located in New York City’s financial district. Reprinted from New York City’s Financial District in Vintage Postcards by Randall Gabrielan (pg. 47, Arcadia Publishing, 2000). 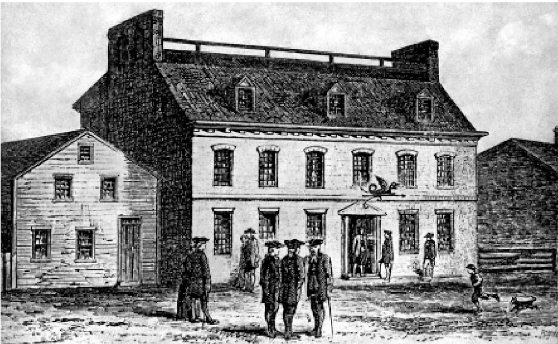 Although the site of Fraunces Tavern has been in use since 1671, it was not utilized as an inn until 1762, when owner Samuel Fraunces opened the building as a tavern called the Queen’s Head. The pub became a popular meeting place of the revolutionary group the Sons of Liberty, and was used as the site for Washington’s peace negotiations with the British at the end of the Revolution. Fraunces was also the famed site of Washington’s farewell to his troops following the Revolution. Meeting in the Long Room of the tavern, Washington thanked his officers for their work during the Revolution, before taking his leave for Mount Vernon. Today, Fraunces Tavern continues to operate as a bar and restaurant, offering upscale cuisine. The site also has the Fraunces Tavern Museum, which offers tourists the opportunity to see restored versions of the Long Room and Clinton Gallery, a federalist-style dining room. The museum and restaurant are open seven days a week to the public. At the heart of Boston’s government district, you’ll find the nation’s oldest continuously operating tavern, the Bell in Hand. The small pub is a clear testament to its institutor’s previous work: founded by Boston’s last town crier Jimmy Wilson in 1795, the tavern was named after Wilson’s infamous bell. Wilson was a well-known figure in 18th century Boston, and reported on some of the biggest events of his time, including the Boston Tea Party and the signing of the Declaration of Independence. Wilson soon became just as famous for his bar as he had for his news reporting. Frequented by figures like Daniel Webster and Paul Revere, the Bell in Hand’s shining star was its cream ale, which was so thick it required two mugs – one for the ale, and one for its froth. Wilson didn’t believe in the “hard stuff,” so the cream ale was strongest drink the tavern sold until 1919. The Bell in Hand Tavern dates back to 1795. Reprinted from Boston Beer: A History of Brewing in the Hub by Norman Miller courtesy of Sara Withee (The History Press, 2014). Today, however, the Bell in Hand offers much more than that famous ale. Featuring live music and DJ’s every night, the Bell in Hand is a neighborhood bar that becomes a popular nightclub once the sun goes down. A favorite of local 20 somethings, the pub is still located at its original site near historic Faneuil Hall. Although Boston is already deeply steeped in American history, those looking to walk the trail of the Founding Fathers should stop in at the Green Dragon Tavern. Although the Green Dragon isn’t located in its original building (which was razed during the 1850s), you can still see a small sketch of one of the oldest taverns in America on its current walls. A sketch of the original Green Dragon Tavern, which hangs in the current Green Dragon Tavern (on the right). Reprinted from Boston Beer: A History of Brewing in the Hub by Norman Miller, courtesy of the Boston Public Library and Sara Withee (The History Press, 2014). Founded in 1654, the Green Dragon is technically Boston’s oldest bar, and previously served as one of the general meeting places for several revolutionary organizations, including the Sons of Liberty and the Boston Caucus. Legend has it that this pub is where Paul Revere first heard of Britain’s plans to march on Lexington and Concord, leading to his famous journey by horseback. What is true, however, is that Revere started his famous night-ride to Lexington from the original Green Dragon in 1775. Revere was not the only Revolutionary hero to patronize the tavern, however – John Hancock and Daniel Webster also frequented the Green Dragon, with Webster dubbing it the “headquarters of the revolution.” Indeed, events like the Boston Tea Party were planned within the pub’s walls. 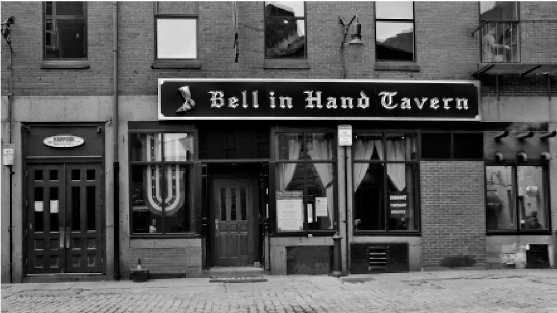 Today, the bar is located in a small space in Boston’s North End, and caters to a young crowd on most nights, like its contemporary the Bell in Hand. Once known as Beers Tavern, Ordinary has been around since the 1600s, when it first opened for business only some 20 years after the founding of the city of New Haven. The pub has held several roles over its long history, ranging from general shop to bookstore, but during its earliest days, the bar maintained a successful inn. During the Revolutionary Era, Isaac Beers led as the Ordinary’s innkeeper, leading to the moniker of Beers Tavern. Under Beers, the Ordinary found itself at the center of New Haven’s political activity, as local leaders used the building as an unofficial meeting place. This choice to frequent the bar led to the Ordinary’s historic association with the infamous Benedict Arnold, who rode to the pub in 1775, demanding the keys to the town’s powder house from the Town Selectman. His objective was singular: to bring New Haven’s militia to assist the Patriots at the beginning of the Revolution. His ride was successful, and New Haven’s militia journeyed to Cambridge, Massachusetts following the British attacks during the Battle of Lexington. Several years later, Arnold would betray his comrades and the militia he led by joining the British army in 1780. The inn also hosted several famous guests, including General George Washington, who stayed at Beers Tavern for a night with Martha Washington on his way to Cambridge, Massachusetts. The bar still proudly commemorates this fact with a plaque on the building’s wall, which details Washington’s route through New Haven. Since the closing of the Taft Hotel, the Tap Room has been renovated by several proprietors, but is today headed by four restauranteurs, who have revived the bar in its early 20th century style. Today, the Ordinary features Prohibition-era cocktails and modern cuisine, while keeping its long history alive. The White Horse Tavern in Newport, the oldest tavern in the US. Reprinted from Pirates of Colonial Newport by Gloria Merchant courtesy of Helene Scola (pg. 52, The History Press, 2014). Restaurants frequently look for a claim to fame, and the White Horse Tavern holds the distinction of being the oldest tavern building in the United States. Originally built in 1652, the White Horse opened for business in 1673 under the direction of William Mayes. The large, spacious pub served various purposes beyond offering libations, including as a meeting house for the Rhode Island General Assembly, Criminal Court, and Newport City Council. In 1702, William Mayes Jr. succeeded his father as innkeeper at the tavern. Mayes was well-known in the Rhode Island colony for his previous career as a pirate in the Indian Ocean. After returning home with prize money gained from exploits near Madagascar, Mayes took up his place as innkeeper. Although much-loved and protected by Newport locals, Mayes’ previous life was an embarrassment to British officials, who eventually had him replaced by his sister and her husband. During the Revolution, the White Horse was largely abandoned by colonists, and the building was used to house Hessian mercenaries and British troops while Britain occupied Newport. Following the war, colonists and locals returned to the tavern, where it continued to serve as a bar until the mid 19th century. After time as a boarding house and a restoration, the White Horse returned to its original status as a bar and restaurant in 1957. Today, the White Horse’s colorful history often lands it a spot on lists of “bucket-list bars,” and it continues to host guests on both floors of its original building. Located in Old Town Alexandria, Gadsby’s has been at the center of Alexandria’s cultural life since its founding in 1785. Although it is today a historic staple of Alexandria, Gadsby’s was not the first tavern to be located at its present site – the lot has been occupied by a variety of taverns since as early as 1749. Once Gadsby’s was established, however, it became a well-known local meeting place. Hosting dance assemblies, meetings, and even theatrical performances, the pub and its inn were popular amongst locals and Founding Fathers alike. Guests like John Adams, Thomas Jefferson, and James Madison were all fond of the tavern, and the establishment is perhaps best known for hosting its annual Birthnight Ball, given in honor of George Washington. This ball was attended twice by Washington himself – once in 1798, and again in 1799. The historic Gadsby’s Tavern in 1878. Reprinted from Gadsby’s Tavern by Gretchen M. Bulova courtesy of ALSC (pg. 15, Arcadia Publishing, 2015). However, by the early 1900s, the tavern buildings had fallen into disrepair and were abandoned. After major restoration work from a series of historic societies (including the Alexandria Association and the Daughters of the American Revolution), Gadsby’s was declared a National Historic Landmark in 1963, and was reopened in 1976 for the nation’s bicentennial. Today, Gadsby’s Tavern operates as both a restaurant and a museum, which features daily tours. The restaurant (leased by a private restauranteur) offers a menu that mixes both fine-dining with period dishes, served at tables set in the 18th century style. Have you visited any of America’s “bucket-list” historical bars? Let us know in the comments below! If you’re interested in America’s most historic bars, consider one of the books below.